When heart patient Harold Byrd complained of shortness of breath, exercise physiologist Rhonnda Cloinger urged him to see his cardiologist right away – advice that probably saved his life. When 77-year-old Harold Byrd ex­perienced shortness of breath, it was originally attributed to a virus. 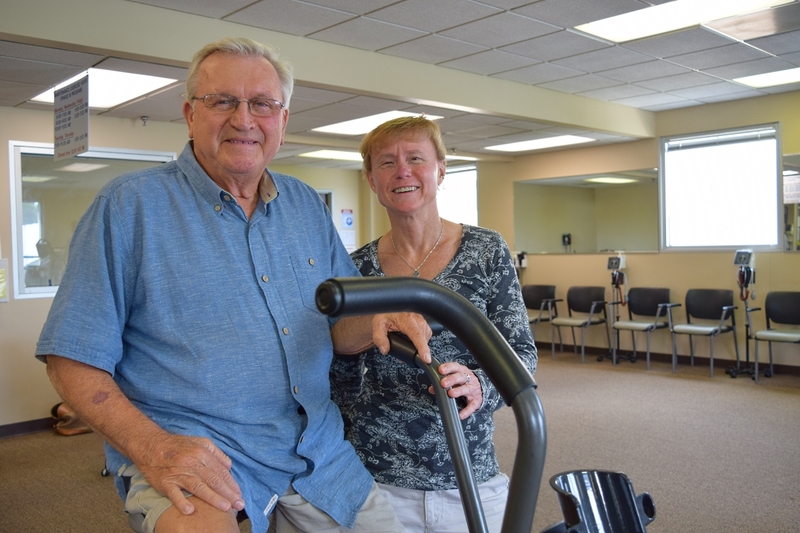 But when the symptom didn’t go away, he told Rhonnda Cloinger, an exercise physiologist for the Parkwest cardio­pulmonary rehabilitation program at Fort Sanders West. She responded in no uncertain terms: “See your heart doctor!” It was advice that likely saved Byrd’s life. The ensuing visit to his cardiologist resulted in a heart catheterization, thrombectomy and two stents after a blood clot was found to be blocking 99 percent of Byrd’s right coronary ar­tery. Byrd, who had his first cardiac stent in 2008 and a pacemaker and defibril­lator implanted in 2009, had under­gone Parkwest’s 36-session “Phase 2” cardiac rehabilitation program after each of those heart events. In the Phase 2 program, patients wear heart moni­tors during their thrice-weekly exer­cise visits. Each time after “graduating” from Phase 2, Byrd enrolled in the volun­tary Phase 3 maintenance program. In that program, patients do not wear the monitors and are required to immedi­ately report any pains or symptoms to the rehab staff. While Byrd’s visit to his cardiolo­gist confirmed her suspicions, Cloinger said she was surprised at the extent of the blockage. “He was a walking time bomb,” she said. When he was discharged from the hospital, Byrd found himself back in familiar surroundings in the cardiac rehab Phase 2 program. But this time there was a twist. Under a new inten­sified program launched just months earlier, he would be going five days a week instead of three, and seven weeks instead of 12. Byrd’s results were indeed remark­able. Over the course of the intensified Phase 2, Byrd saw his blood pressure drop from 130/70 to 114/60. His exer­cise time increased from 34 minutes to 54, and his MET level (Metabolic Equivalent of Task, a measurement of the amount of energy expended during activity) jumped from 2.7 to 4.6 – a 70 percent increase. His BMI (Body Mass Index) went from 32.3 to 30.6.